If nature would've cooperated, this post could have been a happy tale of 4 people trekking across green meadows and sleeping under stars. As it happened, our 3 day backpacking trip was cut short by a freezing cold rainstorm at 10,000 feet and our tent which kept out the water about as well as a single slice of Swiss cheese. My brother had planned our little backpacking trip a few months ahead of time. 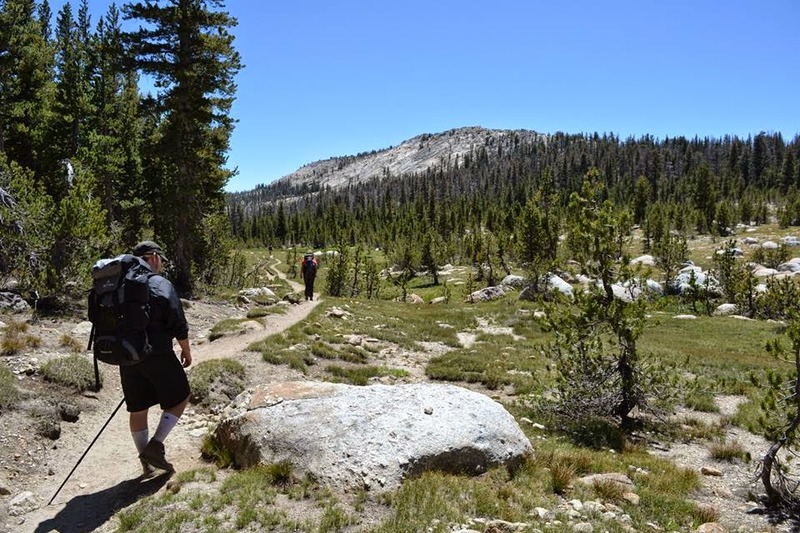 The plan was to hike 8 miles from Tuolumne Meadows to the Sunrise High Sierra Camp on the first night, then 5 miles to a spot on Sunrise Creek the second night, and finally 11 miles to Half Dome and back into Yosemite Valley on the third night to stay at the backpacker’s camp. 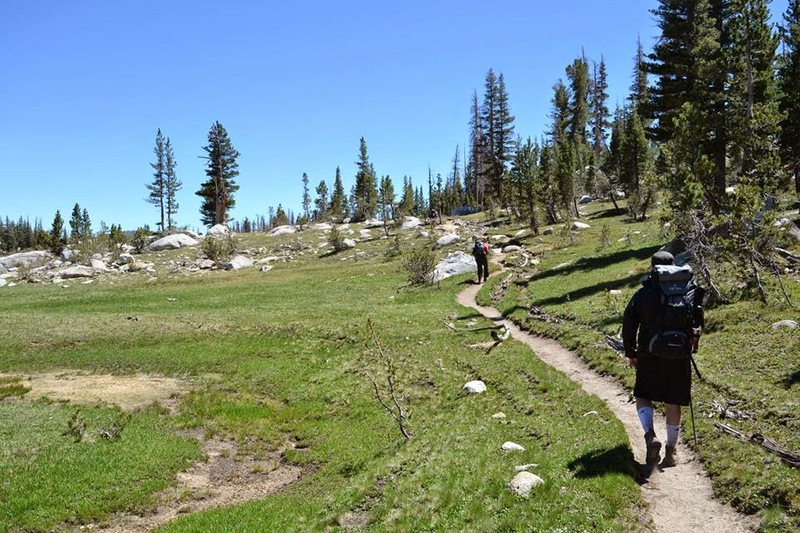 We headed out from Tuolumne Meadows early on the first day and headed to Sunrise High Sierra Camp on the John Muir Trail. 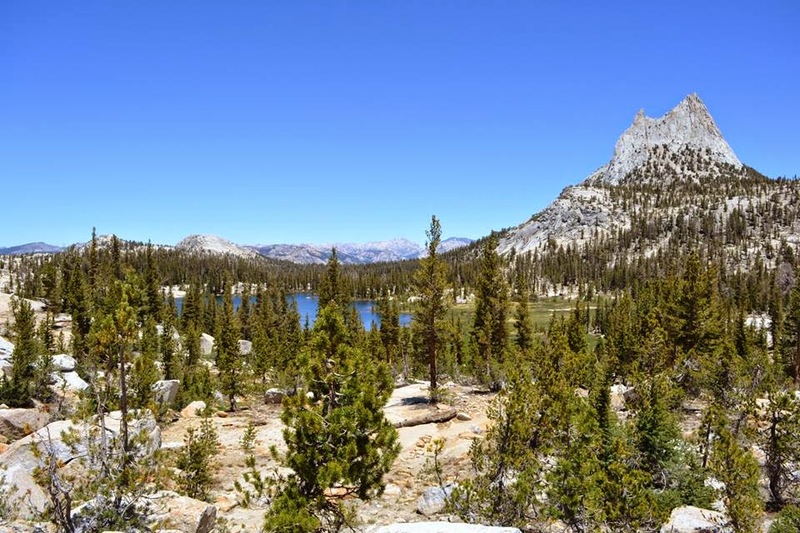 This 8 mile section of the John Muir Trail is one of the most beautiful trails in the United States. You pass through redwood forests, towering mountains, across pristine meadows, past glacial lakes and granite domes. There were several natural springs along the trail where you could fill your water bottle directly from the creek. We had blue skies and 65 degree temps all day. It was a glorious day. 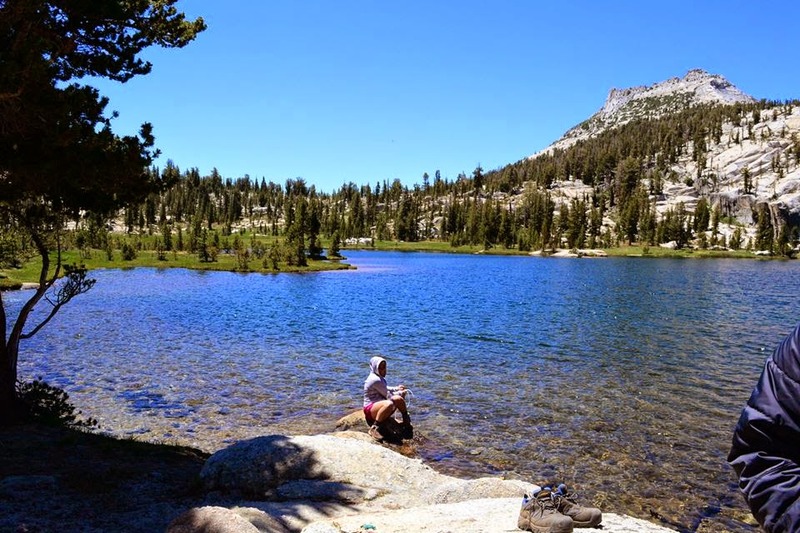 The Sunrise High Sierra Camp is built along the hillside of the High Sierra Trail. The canvas cabins were still down and the stone lodge was closed, so the only amenity we had was an outhouse and a creek for filtering water. The mosquitoes were out in force, so we started gathering wood for a campfire the minute after we set up our tents. We made a huge pile of wood at the community fire ring. There were about a dozen other people at the camp when we arrived, but no one lifted a finger to help us gather wood. By contrast, you should have seen the amount of "help" we got when were actually lighting the fire. We spent the evening sitting by the fire, boiling water for our Mountain House Meals. The Mountain House “Chicken with Rib Meat ad Mashed Potatoes” is quite literally the best freeze dried meal I've ever eaten. By sundown, there were about 20 people hanging out by the fire with us. Fast-forward to 4am. The temperature outside plummets to 38 degrees and the rains starts, slowly at first, and then it turns into a torrential downpour that lasts 6 hours. By 10 am, our 2-man tent is sagging on top of us. Water has soaked our sleeping bags and all of our gear. My girlfriend is on the verge of tears. We can’t access the weather through her phone, so we have no idea how long the rain is supposed to last. The forecast had called for clear skies, so the rain was a complete surprise. There is no hell on earth like laying in a soaking wet sleeping bag in near freezing conditions, miles from civilization, while you're girlfreind is sobbing next to you. 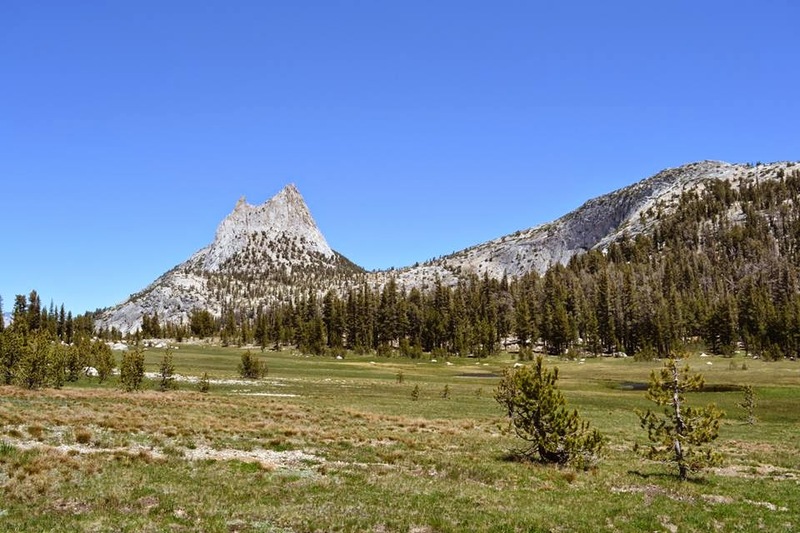 We made the decision to break camp and head back to Tuolumne Meadows, rather than risk 2 more nights in the rain with a useless tent and soaked gear. We hike 8 miles over the mountain in less than 2 hours with our wet packs that weigh twice as much as they had the day before. The rain literally never lets up and temperature never really gets above 45 degrees. We stopped once for 5 minutes to eat a granola bar. The trail that had been so beautiful the day before, was now completely blanketed by a heavy endless fog. We passed at least a dozen other hikers on the trail who looked as miserable as I felt. We reach our car around noon and change into dry clothes. We drove into 2 hours to Oakhurst and shelled out 189$ for a motel room that would have cost 40$ anywhere else in the United States. We spent that night in the motel watching cable movies and eating BBQ Brisket in our comfy queen-size bed. My brother and his girlfriend actually continued on to Half Dome. A bear raided their campsite the next day and rummaged through their gear. Other than that, he says they never ran into any more problems and they made it to the dome. I guess the lesson here is to splurge for a better tent?